Principles of normal water balance. In most steady-state situations, human water intake matches water losses through all sources. Water intake is determined by thirst (see Fig. 1-12) and by cultural and social behaviors. Water intake is finely balanced by the need to maintain physiologic serum osmo-lality between 285 to 290 mOsm/kg. Both water that is drunk and that is generated through metabolism are distributed in the extracellular and intracellular compartments that are in constant equilibrium. Total body water equals approximately 60% of total body weight in young men, about 50% in young women, and less in older persons. Infants' total body water is between 65% and 75%. 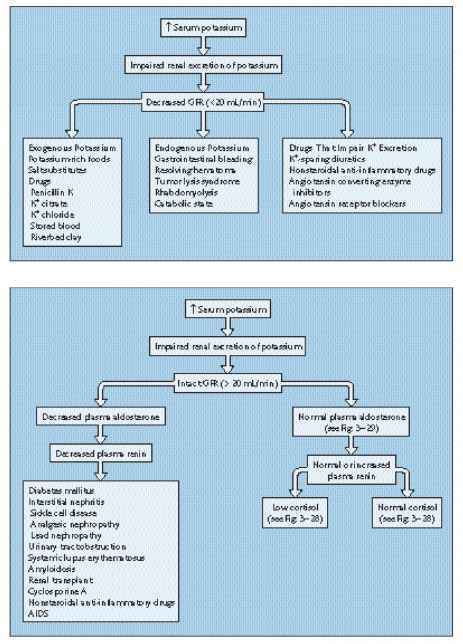 In a 70-kg man, in temperate conditions, total body water equals 42 L, 65% of which (22 L) is in the intracellular compartment and 35% (19 L) in the extracellular compartment. Assuming normal glomerular filtration rate to be about 125 mL/min, the total volume of blood filtered by the kidney is about 180 L/24 hr. 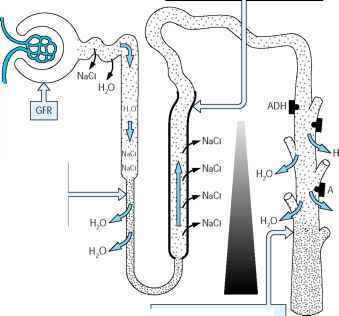 Only about 1 to 1.5 L is excreted as urine, however, on account of the complex interplay of the urine concentrating and diluting mechanism and the effect of antidiuretic hormone to different segments of the nephron, as depicted in the following figures.